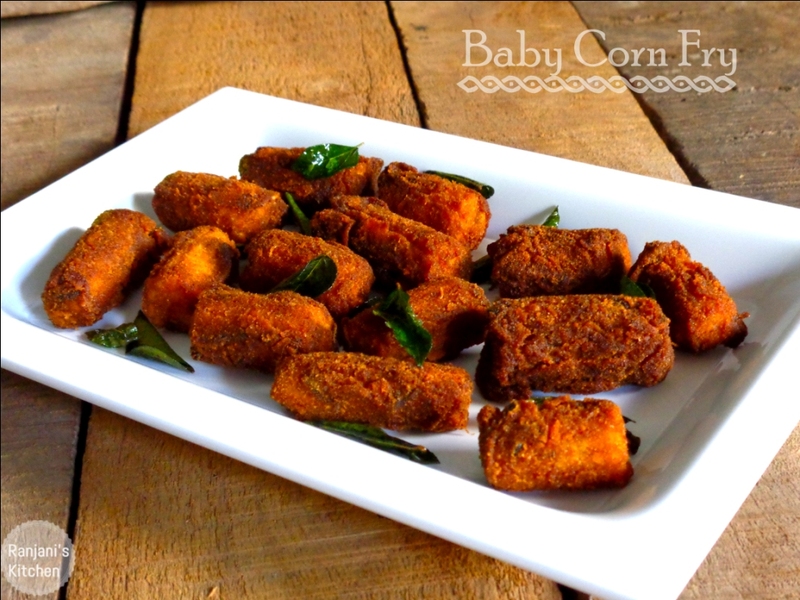 Baby Corn Fry, a crisp and healthy snack to have with tea. 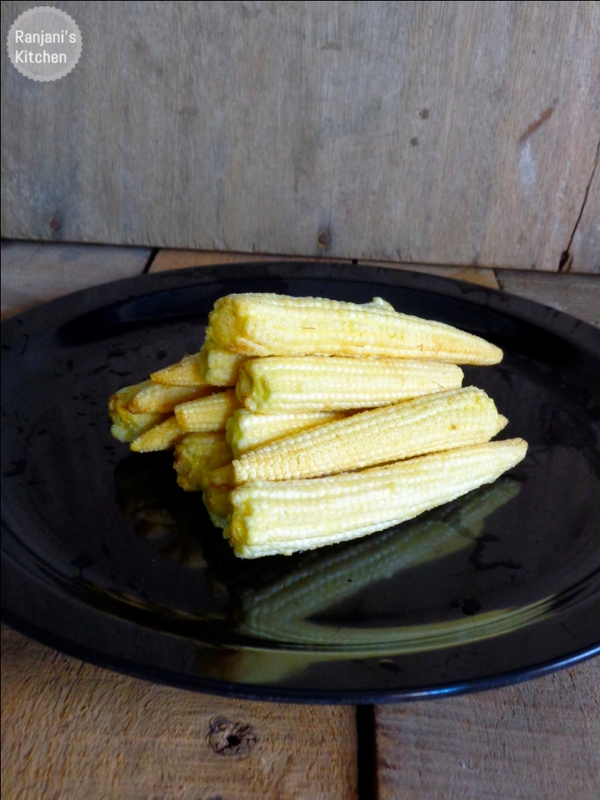 Baby corn is little and immature ,harversted corn in earlier stage.It is easy to make any dish like dry or gravy versions because no husk removal work and all. Simply wash,trim the edges and cook. 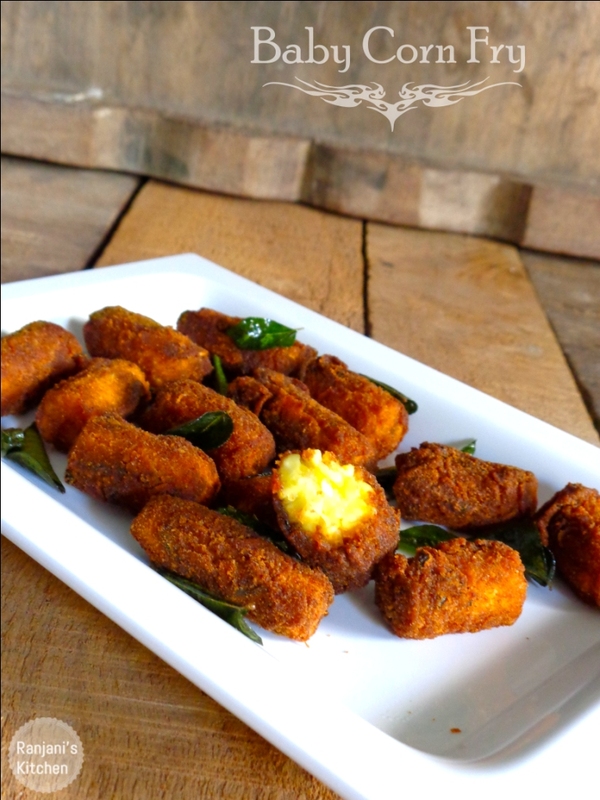 Here is hot munch to enjoy in this climate with a cup of chai. Wash baby corns, pressure cook for 4 whistles with enough water or Microwave high for 8 minutes. After cooking, drain the water completely and cool to room temperature. Cut into medium even pieces to marinate. Mix altogether by adding little water. Do not make it as a runny paste. The batter should be thick enough to coat the baby corns. Now add cooked baby corns to the batter. Blend well to coat the masalas in corns. Refrigerate or sit in room temperature for 30 mins. Spread bread crumbs in a plate, roll corns in it, gently tap and place in a seperate plate. Heat oil in a kadai, once the oil heated, keep in medium flame to fry the corns. Put 2 to 3 pieces at a time in oil, fry golden brown on both sides. Drain the oil well and place in Kitchen towel to absorb excess oil. 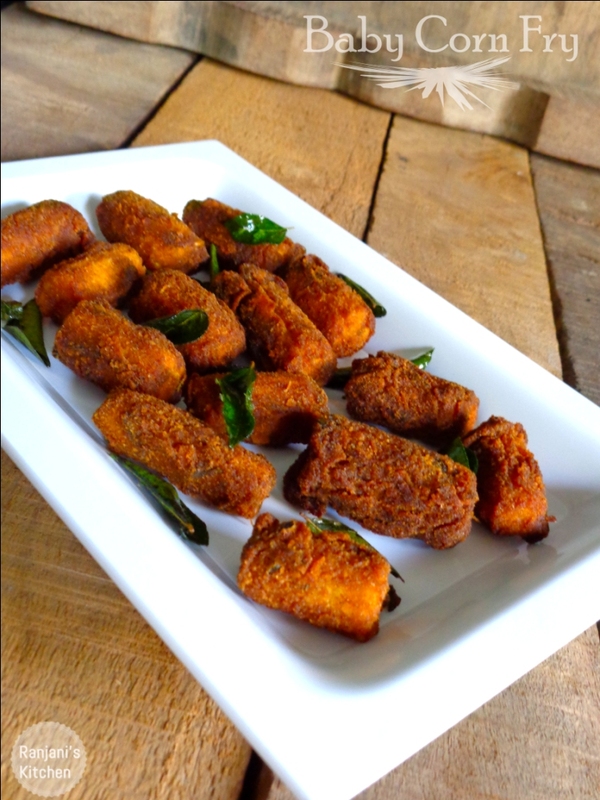 Serve hot with tomato sauce or red chutney. You can fry corns without cutting them and fry in full size. Amchur powder and chat masala is optional. If you don’t want , you can skip it. You can add 1 tsp of rice four, to make it more crispier. Addition of kassori methi will give flavor. Without adding also you can try. I am ready for supper..
Once again, looks great! I’m ready to try this recipe. I had a doubt. After the step 7 : Refrigerate or sit in room temperature for 30 mins, there is a picture which shows that the baby corn is coated with some powder. There is no mention about this in the preparation instructions. Are they bread crumbs? Kindly let me know 🙂 Thank you.